Mexico's National Museum of History is located in Chapultepec Castle, a historic building of great symbolic and historical value for Mexicans. The castle is on the highest point of the hill in the center of Chapultepec Park, overlooking Mexico City's huge green space. The construction of the castle began in 1785 by order of Bernardo de Galvez, who was viceroy of New Spain at the time. It originally served as the summer home of the serving viceroy, but over time, the building was adapted to different uses, serving as a military college, an astronomical observatory, official residence to Emperor Maximilian of Hapsburg and Empress Carlota, and then for several years as the official presidential residence. Some important events took place here, including the Battle of Chapultepec during the Mexican-American War, when the building was in use as a military academy. Along with a few hundred soldiers, several young cadets (aged 13 to 19) lost their lives in the battle, which took place on September 13, 1847, and they are remembered as Los Niños Heroes ("the child heroes"). An often-told legend is that seeing that the battle was lost, one of the cadets, Juan Escutia, wrapped himself in the Mexican flag and leaped to his death from the castle walls, to evade the invaders and deny them the privilege of taking the flag. A monument in the park recalls those who lost their lives protecting their country: its official name is Altar a la Patria, but it is often referred to as the Monumento a los Niños Heroes. President Lázaro Cardenas decided to move the presidential residence to a more understated location, Los Pinos, which is also in the Chapultepec Park, and in 1944, Chapultepec Castle was inaugurated as the Museo Nacional de Historia. The National Museum of History offers an overview of the history of Mexico from the conquest and formation of New Spain up to the early twentieth century. The museum exhibits are divided into two main sections: the former military school and what is referred to as the Alcázar which contains furnishings and the personal belongings of people who lived here, including Emperor Maximilian and Empress Carlota, and president Porfirio Diaz, among others, as well as objects which belonged to the heroes of Mexican Independence and the Mexican Revolution. The museum also hosts temporary exhibits and events such as concerts, workshops, and lectures. For information about temporary exhibits and events, check the museum website or Facebook page. The grounds: The museum has lovely gardens and courtyards as well as interesting statues and monuments on the grounds, so take some time to walk around and explore, and enjoy the views of the park and the city beyond. Coat check: It is not permitted to enter the museum with bags and packages. You will need to leave your belongings at the coat check, which is complimentary for museum visitors. Accessibility: The museum has wheelchairs available for loan, and the museum is equipped with ramps for many of the spaces, although not all spaces are wheelchair accessible. 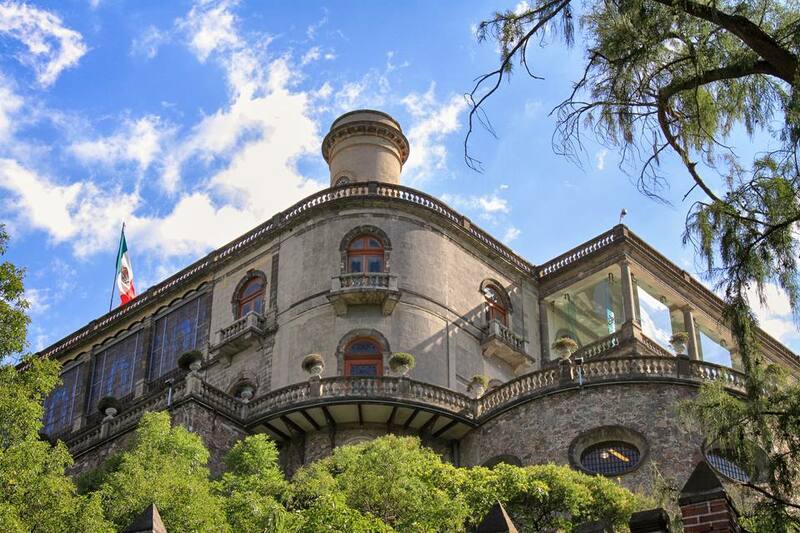 The museum is located inside the Castillo de Chapultepec (Chapultepec Castle) in the Primera Seccion (First Section) of Chapultepec Park, within the park gates, next to the lake and near the zoo. Take the Mexico City metro Line 1 to Chapultepec station, enter the park, pass the monument to the Niños Heroes and you will find the ramp leading up to the museum. Auditorio metro station is also fairly close. If taking the Turibus, get off at the stop near the Anthropology Museum, enter the park gates and follow the signs from there. The museum is accessed by a ramp that starts at the foot of the hill and leads to the castle's gate. The walk is pleasant and offers nice views, but it is on an incline. If you're not up for the walk, there is a little scenic train that takes passengers up the hill. The museum is open from 9 am to 5 pm Tuesday to Sunday, and closed on Mondays. General admission is 70 pesos per person, free for children under 13. Admission is free on Sundays for Mexican citizens and residents. Mexico City is one of the cities with the most museums, and many of them are located in and around Chapultepec Park. Some others that you might consider visiting while you're there include the National Museum of Anthropology and Museo Caracol, which are very close by. Check out other museums in Chapultepec Park.